"The Unconditioned Mind is a sensitive account of the founding of a Krishnamurti school and the relationships central to it. David Moody's recollections of Krishnamurti are beautifully written and make this a fascinating read. I was especially touched by the passage where he gazed into Krishnamurti's eyes and felt it was "...like looking through a clear window, with only open space on the other side." �Like an iridescent diamond,� is how David Moody describes revered philosopher Jiddu Krishnamurti in this intimate portrait of him at the Oak Grove School in California. Krishnamurti, once groomed by Theosophists to become the next World Teacher, founded the school in 1975 and personally oversaw it for the last decade of his life. 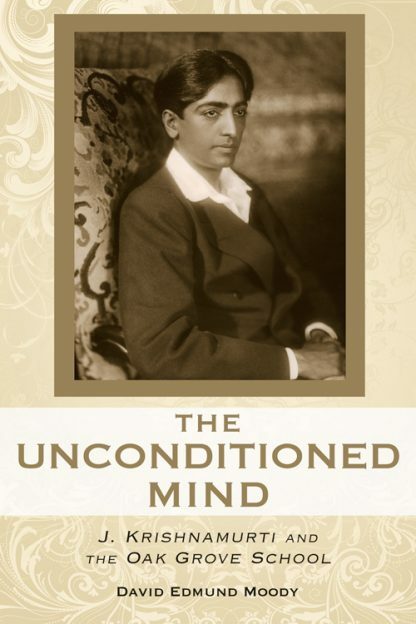 Moody, Oak Grove�s first teacher and later director, recounts their close work together and explains Krishnamurti�s ideas with splendid clarity. He also recounts how those ideas sparked competition among the staff, producing a complex force-field that challenged Moody to the utmost. The resulting drama, and Krishnamurti�s involvement in it, forms the core of this rare, behind-the-scenes view.